Microsoft is reportedly gearing up for the imminent release of its long-rumoured disc-less Xbox One S console. According to leaked promotional images obtained by Winfuture.de., Microsoft will release the ‘Xbox One S: All Digital Edition’ on May 7th. Often-reliable Microsoft news site Thurrott subsequently corroborated this information with its own sources. As the name suggests, the console will not have a disc drive, meaning it will only be able to play digital games. Xbox One S: All Digital Edition owners will need to download games from the Microsoft Store. 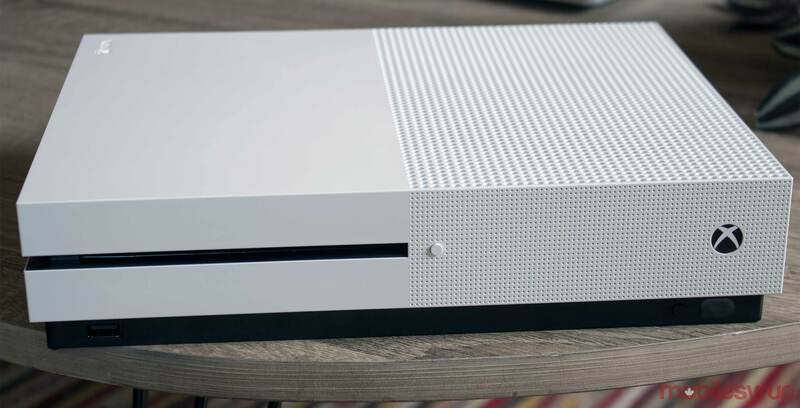 Otherwise, the system is expected to have all the other features of a regular Xbox One S.
According to the images, the digital-only console will cost €229, which works out to about $259 USD or $350 CAD. As noted by Thurrott, this price is likely higher for Europe and seems to include taxes, which could explain why it costs about the same as a regular, disc drive-sporting Xbox One S in the U.S. Therefore, Thurrott expects the price of the console to be cheaper in other markets. For comparison, a 1TB Xbox One S bundle is regularly priced at $379.99 in Canada. Alongside the console, Microsoft is also reportedly planning to debut a new ‘Xbox Game Pass Ultimate‘ service that bundles together Xbox Game Pass and Xbox Live Gold services at a lower price. Additionally, Thurrott notes that there’s a rumoured program called ‘Odessa’ that will let users trade in physical games for a token to download the digital versions of these titles. This service would certainly be ideal for a disc-less console, although Thurrott wasn’t able to confirm more details about how exactly it might work. Microsoft is expected to officially unveil the console during its Inside Xbox livestream on April 16th at 5pm EST.